AzhwAr again thinks of emperumAn measuring the worlds and reminisces about it. minnai udai Agak koNdu ulagu aLandhAn – measured the worlds, wearing lightning as his divine clothing. mannu maNi mudi nINdu aNdam pOy – the crown of emperumAn, decorated with beautiful gems and being appropriate to his greatness, stretched up to the wall of the universe . aNdam pOy eN dhisaiyum mannu mudi nINdu – the crown which is symbolic of emperumAn being the lord of all the worlds, stretched in all the eight directions up to the end of universe. minnai udaiyAgak koNdu – since the crown went beyond the clouds and grew, emperumAn utilised lightning as his dress. anRu ulagu aLandhAn – he measured the worlds which he received as gift from mahAbali during that time. 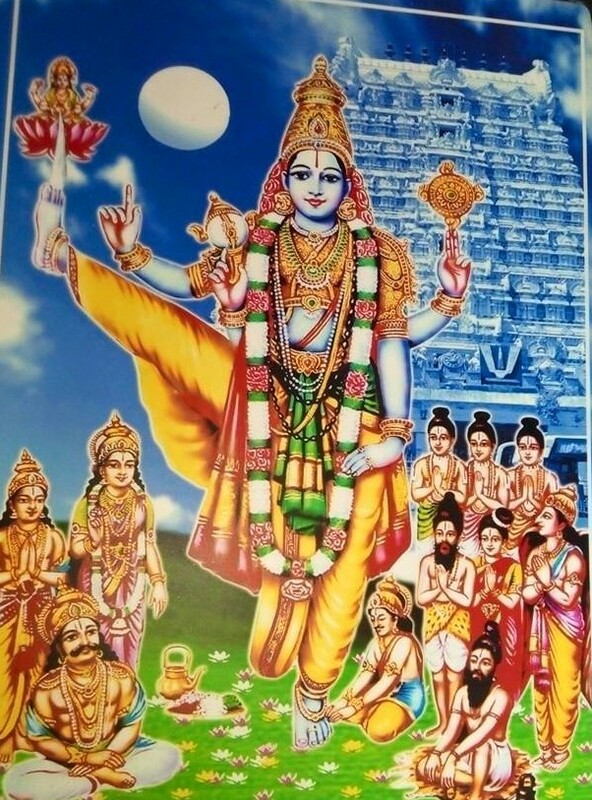 kunRam kudaiyAga AkAththa kO – emperumAn who held gOvardhana hill as an umbrella and protected cows. Once (when he measured the worlds) he hid the worlds with his divine feet. Once he hid himself when he lifted the gOvardhana hill. Measuring the worlds was the activity that he carried out on the day that he was born [as vAmana]. Lifting the hill as an umbrella was the activity that he carried out when he was seven years of age. In the former case, he protected all the worlds. In the latter case, he protected one town. We will move on to the 42nd pAsuram. This entry was posted in iyaRpA, mUnRAm thiruvandhAdhi on April 9, 2018 by T N Krishnan.